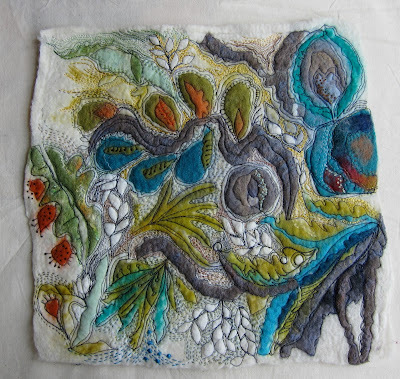 I have been admiring the beautiful embroidered felt creations of fiber artist Jackie Cardy for some time now on Flickr. On her blog, Dog Daisy Chains and Flickr stream, you can get a glimpse of her works in progress and her wonderfully detailed process. It's a pleasure to introduce her to you all - meet Jackie! Where does the name "Dog-Daisy" come from? Well, you know that moment when you first encounter the web outside of emails and you take the first tentative steps into Flickr 'just to see how it works' and of course you're a bit shy about putting your real name but you're not quite ready and the first thing that comes into your head is the dog's name? Well that's what happened. My lovely now long deceased Daisy is immortalised in cyber space! Then the blog... I wanted to call it 'Dog Daisy' but someone already had that, then I wanted 'DaisyChains' but that, too was taken so inevitably the ridiculously named 'DogDaisyChains' was born. 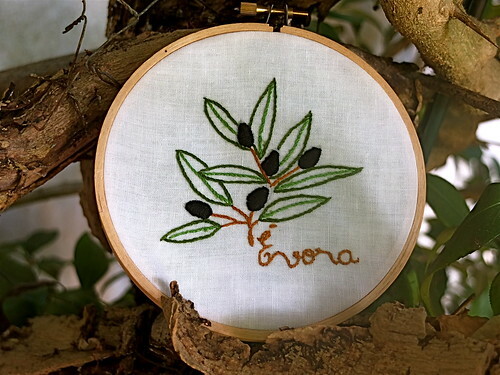 Did you embroider as a child? How did you learn your craft? Oh yes. 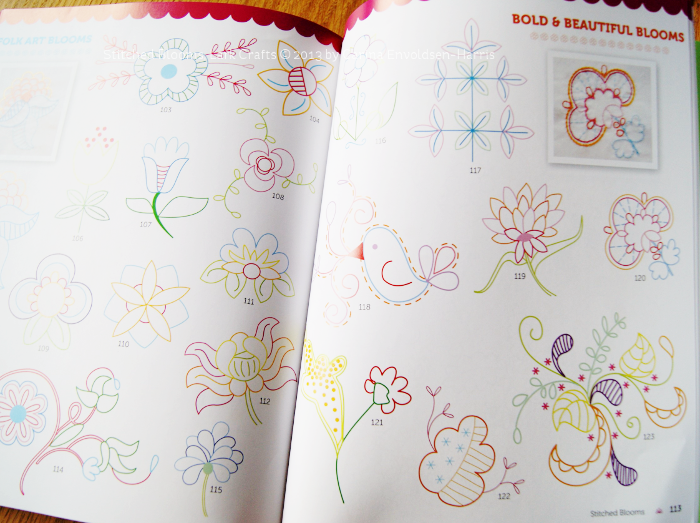 Like most stitchers I think, I was always making and sticking and glueing and sewing as a child. My idea of School Holiday Heaven was to get a book about crafts from the library and work my way through it making the things in it. My Grandma taught me how to embroider and my cousin (who I idolised and is a few years older than me) and I, used to sew and draw together. I was always sewing something. I made my first dress at my cousin's house when I was 16... a navy blue with red dots high-waisted puffed sleeved mini dress, 1967. Then I made almost all my own clothes. I was stick-thin and they didn't take much fabric or time. I don't do it now! I saved lots of offcuts to make little dresses for possible future little daughters but I got two boys so I used the fabrics for patchwork! After I'd had my boys I discovered a City and Guilds Embroidery Class near where I live so I signed on and learnt new skills especially free motion machine embroidery and I've been producing ever since. 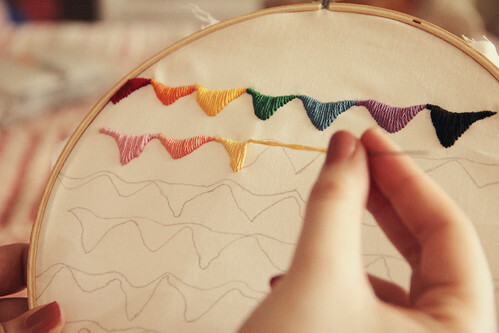 Do you prefer to do hand-stitching or machine embroidery? As I said above, I love free machine embroidery as it gives a fast result in a long process, and defines areas by drawing with the needle, but in my recent work I am doing a lot more hand stitching to enhance the final piece after machine stitching. I have always loved stitching by hand, the sound when the thread is pulled through the taught fabric, and the calming rhythm and the wonderful surface texture it creates. Do you have any other artistic hobbies? 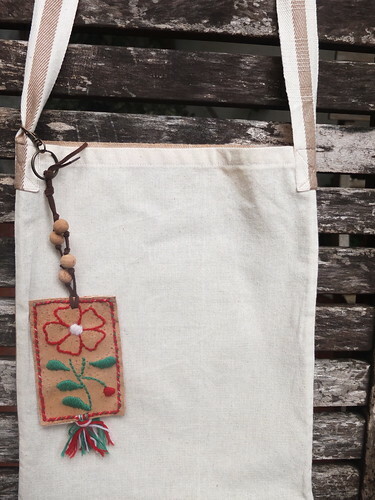 Embroidery is such a time-consuming process that I hardly dare get into anything else! I have been doing a bit more drawing lately, just mark making with various media to try to free myself up a bit. I used to be very good at it but if you don't use it ...I lost it. I am very interested in Floristry which I did as a hobby and for church, and recently did the flowers for two weddings, bouquets, buttonholes, table centres and everything. It was a lot of work and although I really enjoyed it my fingers aren't up to it these days. Of course I am an avid felt maker. I suppose felters might not recognise me as such, because my 'painted' felt backgrounds are just that.. backgrounds for further embellishments in the form of stitch. I love reading, walking with my little dog, listening to the radio. BBC Radio 4 has a great variety of plays, documentaries and current affairs programmes throughout the day and I always have it on when I'm working. I'm not a very good photographer but I love trying. Your creations are incredibly beautiful. 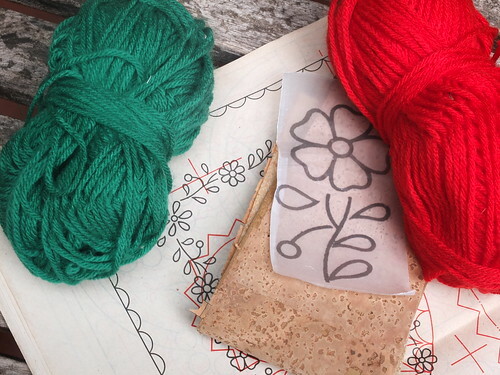 What is the typical process you follow when making one of your embroidered felted pieces? Well of course I start with the felt. I choose a base colour and then cut pieces from already part-felted pieces until I've built up a design or pattern that is pleasing. I add other wisps of coloured wool in a painterly way to create interest and depth to the piece and perhaps other lightweight fabrics which will felt in, to create a complex surface. When the felt is rolled and rinsed and dried I lay a piece of clear plastic on it and using a permanent pen, I draw lines on the plastic where I think I might sew and add extra definition to the pattern. If it goes wrong I start again with another piece of plastic. 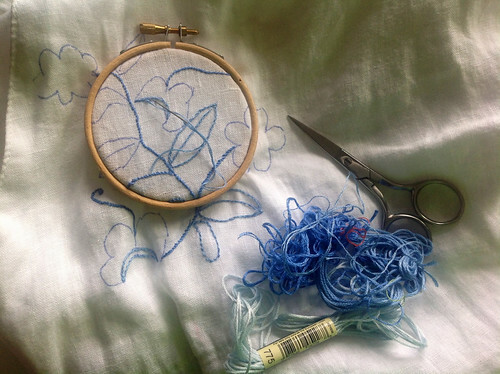 It cuts down on unpicking or disaster if you plan where you're going to stitch first! Then, keeping the plastic to hand to remind myself, I start stitching on the sewing machine, often placing the plastic back on the fabric to remind myself where I'm going next. I might add hand dyed velvet at this stage, as with my brooches. When the machine stitching is done, I move to a comfortable chair and sit and add hand stitches such as French Knots and running stitch, seeding, satin stitch and detached chain until I feel the piece is complete. It's a bit like the satisfaction you get from hand quilting. 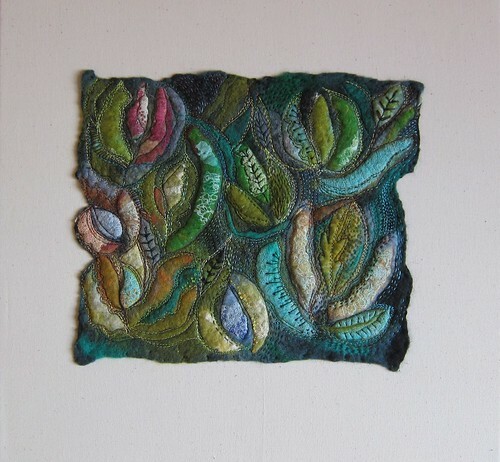 In other work I might stitch individual motifs and cut them out and create a background of felt to attach them to, or even just attach them to a canvas without a background. The fabrics and threads themselves make me want to create. I love combining the colours, coming upon an unexpected combination and working with that. I am also very inspired by the landscape particularly around where I live and walk my dog. I walk along looking at the leaves on the paths in the woods, at the rushes by the edge of a pond, the willow leaves on a bent tree, or the tree trunks with tiny ivy leaves growing up them. Sometimes when I think my work has too many different elements I look at a hedgerow and notice just how many varieties of leaf, flower, berry, stem or grass are growing there, a wonderful confusion of pattern shape colour and texture. A couple of years ago I was part of an exhibition with poetry as the theme and I took for my inspiration 'The Lake Isle of Innisfree' by WB Yeats for my work, using elements of the landscape in the west of Ireland. Patterns and the work of other artists also gets my creative mind thinking; mid century design, William Morris, African Textiles, just about anything! Do you have a favorite color (or colors)? A favorite thread? I have produced a lot of pieces of work using teal, jade, olive, lime and grey, as my response to the poetry theme I mentioned. I looked at the colours of the rocks, mosses, sea and skies of the West of Ireland around the Burren... a great area of barren Limestone rock on the shores of Galway bay. I stay there in early Spring every year while my husband attends a traditional music class and it's magical, so those colours have stuck with me. I think my absolute favourite is pale turquoise/ duck egg blue. I almost always use Natesh Titania variegated thread on my sewing machine, it's silky and slightly shiny without being too bright it's a nice foil for the softness of the woollen felt. For hand stitching I am using traditional Coats Anchor threads at the moment as well as some hand dyed threads from various sources. Thank you Jackie, for this wonderful interview! Olá! Here in Portugal the weather is changing. The first days of Autumn brought us the rain... And working with wool yarn feels good again. After poking around on Tumblr and being inspired there, I decided to try out this Tumblr thing. For about a year now, I have felt that there are SO MANY inspiring projects in our Flickr Embroidery pool that I can barely keep up with them all. It takes time to put together a nice post, even a short one, and I want everyone to see the awesome stuff I'm seeing. I maintain a slideshow on our blog (in the upper right corner, there) to show off all the cool things I find. I'll keep up the slideshow, but I want to add to that. So I'm trying out this Tumblr thing! What I like about Tumblr is that it's super easy to use, and when you post there from Flickr it includes the linkback and credit to the author, which is always important to me. It's also easy to queue posts, and easy to reblog them. When people reblog photos, the credit to the stitcher remains, so it's a great way for people to see your work. So far... I'm liking it! Do any of you guys use Tumblr? 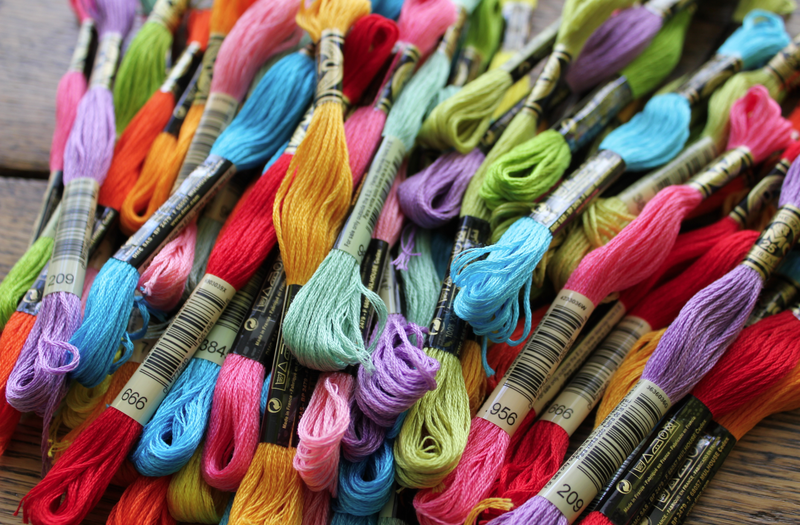 Is there another place you'd like to see us share embroidery inspiration? We've had requests for an official Pinterest, but I'm not quite ready to set that up although I have my own account... What do you guys like? We will absolutely continue to feature cool things here, but for the many "ooh that's awesome" moments I have all day long, I'll be posting to Tumblr throughout the week. Where I live, fall means rain...lots and lots of rain but...with rain comes rainbows! 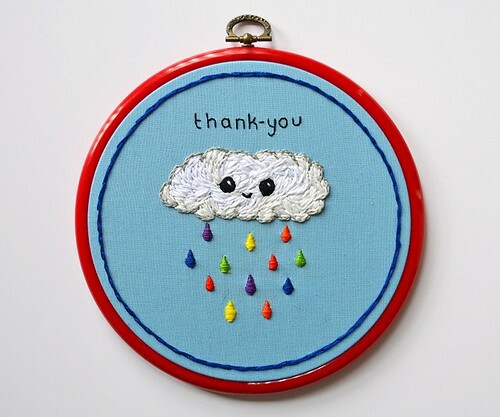 So thank you rain, for helping my garden grown, giving the birds a bath and for making rainbows and thank you Katy from Pixiecraft Handmade for stitching up such a perfect rainstorm. Stitched Blooms - book review and giveaway! Feeling Stitchy's old friend Carina from Polka and Bloom has a book coming out! 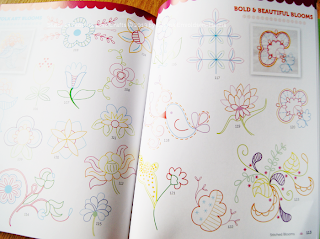 Called Stitched Blooms, it has 300 floral, leaf and border motifs to embroider! We've been very lucky to have a sneak peak at it and I can say it is absolutely gorgeous! 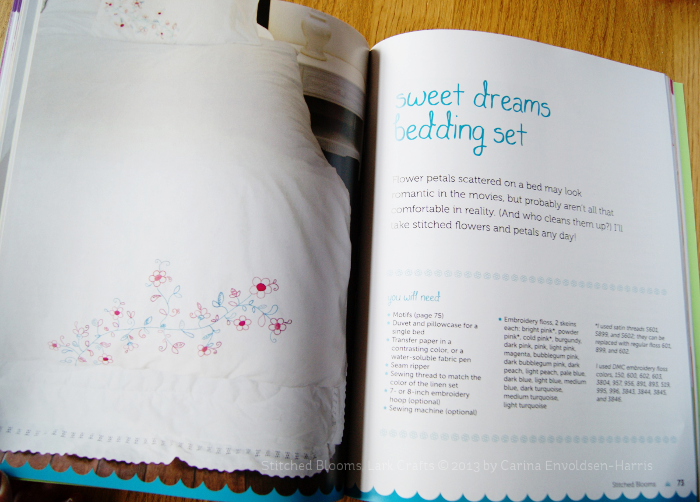 As well as a comprehensive embroidery introduction, there are 20 projects to make. Some of my favourite projects include a Mexican folk blouse, botanical art (I know what's going on my to-stitch list for my Christmas present giving this year), a Dala horse (check out Mollie's version when she reviewed the book) and a sweet dreams bedding set. 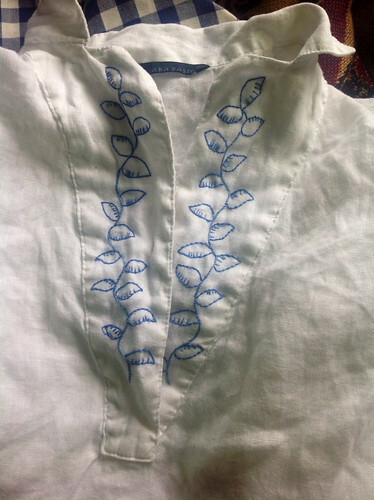 To prove no item of my clothing is now safe, I couldn't resist doing some alteration on an old plain white shirt of mine that had been sitting unloved in my wardrobe. It's still a work in progress, my plans got ahead of me, but this is what I've done so far. 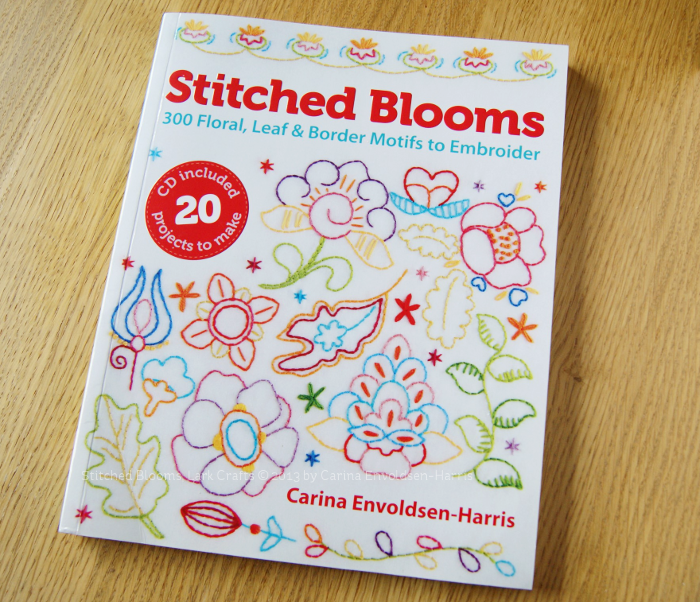 Now that I've hopefully tempted you all, how would you like to be in with a chance of winning a copy of the book and a bundle of seven different colours of floss that are favourites of Carina's? To be in with a chance of winning, simply leave a comment below (and I'd love to know what item you've got sitting round the house you'd like to stitch a motif onto!) The giveaway will run till midnight UK time 30th September 2013 and is open internationally. So congratulations Meghan! Please contact me, Jo and I'll pass your email onto Jody from Satsuma Street and you can tell her which four Satsuma Street patterns you'd like! You can find my email on the 'Email Us' page, the tab for which is at the top of the blog. Also a friendly reminder to Margaret Schindler to also get in touch for her Alison Glass pattern prize! I believe you also have those unique kinds of patterns that are special to you… Haven't you? The pattern I bring today is not a traditional one but it reveals a bit of Portuguese history and a lot about Portuguese culture. Our Mediterranean type climate is very supportive of the growth of olive trees and olive oil, obtained from the fruit of the olive tree, has been produced in Portugal for many, many years. There is evidence that olive trees existed in Portugal back in the Bronze Age and the exportation of olive oil dates back to Portuguese maritime explorations. 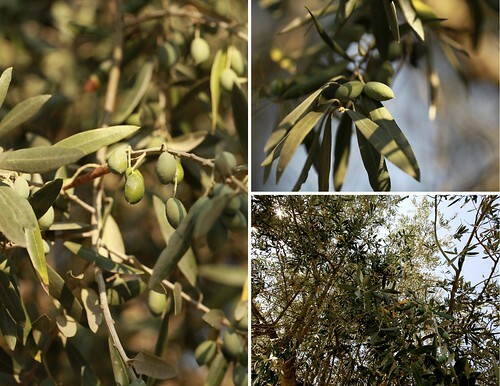 Did you know that an olive tree can live thousands of years? And that Niel Armstrong left a golden olive branch on the moon as a symbol of peace? Happy Tuesday, everyone! I have a cute and easy tutorial for you today, featuring a vintage embroidery pattern available for free from French-Knots.com. 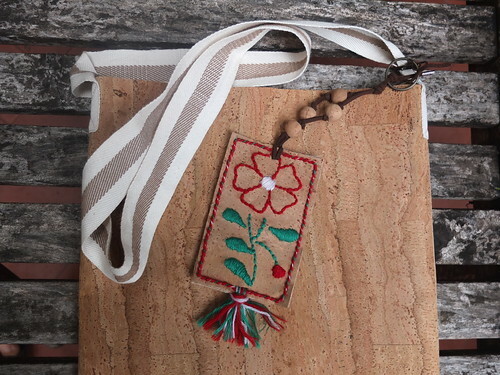 I embroidered this ribbon frame pattern, and added my hand written initial, on the front of a small pouch. I will be doing some traveling in the near future and needed a jewelry pouch for toting around my rings and things. 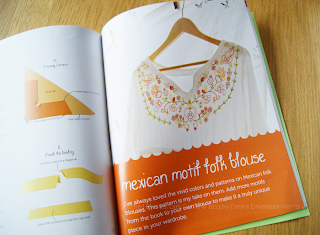 Step One: Transfer your embroidery pattern to your fabric and stitch it up. I used this ribbon and flower frame pattern, and hand wrote my initial into the center. 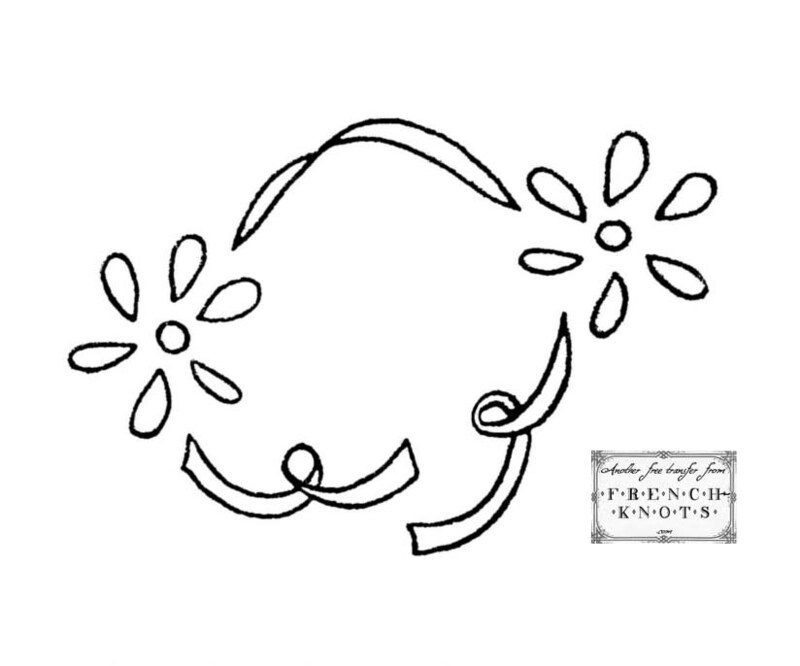 If you don't want to add your own handwriting, there are various embroidery alphabets available, some great ones are available here, or you could use your favorite computer font. Step Two: Place your exterior and lining pieces of fabric right sides together. Mark a 2-inch space that will remain open and unsewn along one of the longer sides. Using a 1/2-seam allowance, stitch around all four sides, leaving that 2-inch space open. Step Three: Clip the corners and flip the fabric out through the 2-inch opening and press. You don't need to worry about stitching the space used to flip just yet. We'll stitch it shut in the following steps. Step Four: With your lining piece facing up, fold over 1-inch of the short edges of fabric and press. Stitch each side along the bottom edge to create the space for the drawstring. Step Five: Fold the fabric in half so that the lining is exposed and the exterior fabric is facing itself. Stitch up both sides using a 1/4 seam allowance, stopping just at the perpendicular stitch, made to create the space for the drawstring. This stitch will close the opening we used to the flip the fabric in Step Three. Flip. Step Six: Run a safety pin through one end of the ribbon or string. Use the safety pin to guide the ribbon, push the ribbon through both sides of the top edge. Step Seven: Knot the ends of the ribbon or string. I decided to trim mine a bit at this stage. Add your items and enjoy! Hope you give this tutorial a try and take it on your next trip! Just a reminder (from my cruddy cellphone camera) that it is not too late to be stitching Reginald! 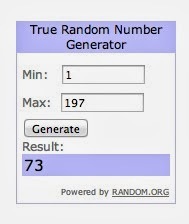 Patterns: Pretty Little Cities - giveaway! 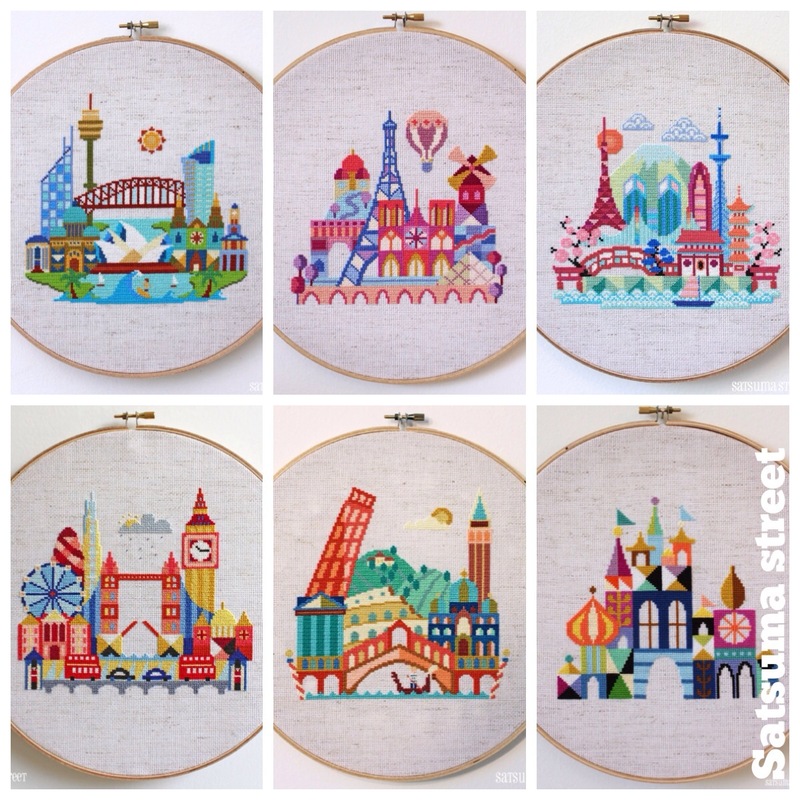 Satsuma Street has increased their range of Pretty Little Cities patterns, adding London, Tokyo, Italy and Sydney! As a Londoner myself I'm so excited about the London pattern in particular, it even has the relatively new addition to the London skyline, the Shard (on the left hand side of the pattern)! 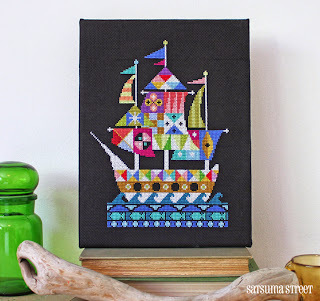 Satsuma Street is also worth checking out for other great cross stitch patterns (I also love the pirate ship). You can find their shop here. 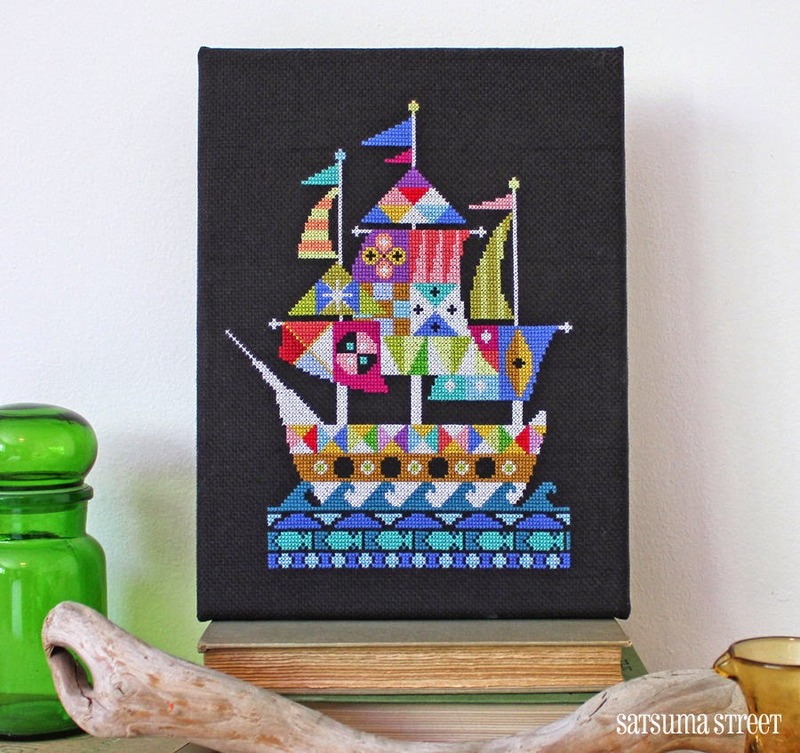 Jody from Satsuma Street has very kindly offered a download of four of her patterns to one lucky Feeling Stitchy reader! To be in a chance of winning the patterns (worth $20! 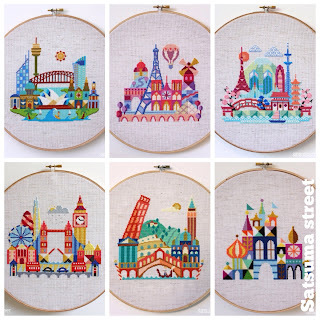 ), simply comment below and because I'm curious, which city would you like to stitch? The competition runs till midnight Wednesday (18/9/13) UK time, don't forget to check back on Feeling Stitchy the day after where I'll be announcing the winner! 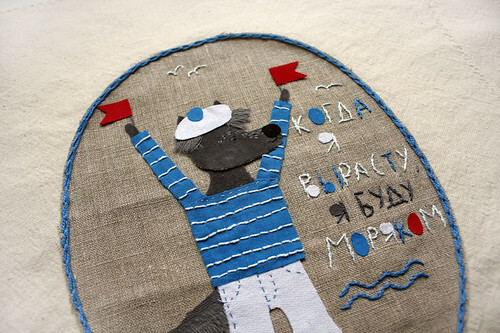 I'm not sure how I first stumbled on the beautiful work of artist Olga Ezova-Denisova on Flickr, but her embroidery immediately captivated me. 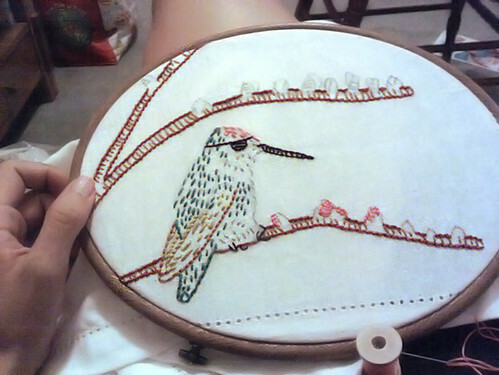 There's something so serene and lovely and composed in her work, and the her stitchwork is just gorgeous. It's an honor to introduce her to you today - I hope you all enjoy this brief interview with Olga! My first embroidery I made about six months ago. I found very old silk threads my mom bought them in the 80s, and I wanted to make something beautiful with them. I embroidered my first brooches with dogs. One, two, three ... I was very fascinated by the process, and I didn’t expect it to be so beautiful. Since then, embroidery began to appear in my illustrations in combination with collage, and as an independent work. What is it about wolves and dogs that inspires you? I have long been thinking about it, trying to understand what is that inspires me about these animals. But I don't get it yet. Maybe I'm living with an image that itself has come up with. The image of the animal that defies to be somebody. That is - to be the master of the dog is a challenge for a man. A wolf… The wolf is a dog too, just wild. And this defiance excites me, and awakens something inside me. Although in my pictures there is no defiance, my dogs and wolves are kind, loving, and sometimes melancholic. Did you attend art school? If not, would you like to? No, I didn’t. As a child, I attended art school for children, but, unfortunately, I didn't finish and that is why I couldn’t get a degree in art education. But I would like to learn, I am open to new knowledge. Most of all I like to study in hands-on workshops with the artists. In Russia I regularly attend creative workshops for illustration and art techniques. My dream is to meet and attend a workshop with some cool artists from America or Europe. I love your process shots - so many different tools and artforms! What other types of art do you enjoy? I enjoy to work in collage-techniques. I love to mix and match different materials: paper, fabric, cutting, embroidery. I like hand-printing techniques like linocut and stamps. I am experimenting with this, and admiring the work of other authors. In addition to visual arts I like to take pictures. I have an old Soviet film camera Kiev-19. I take it with me on my trips. What is your favorite piece you’ve created, and why? It's not a very simple question. Every new work as soon as it is finished becomes the most favorite. But maybe most of all I love my collage work, those in which there are mix of textures, fabrics and embroidery, because they are hard work and take so long to create and I get the greatest satisfaction from the result. Do you have a favorite color? A favorite thread? Yes, I have a favorite color. It's blue and its shades. My favorite thread is Iris. Though of course for different tasks I choose different thread. Thank you, Olga, for sharing a little bit about yourself and your inspiring work with our readers! First of all, if you don't know what I'm taking about, watch this video. After you've stopped dancing and the weirdness has subsided, why not stitch this amazingly cute free pattern from Hancock's House of Happy? 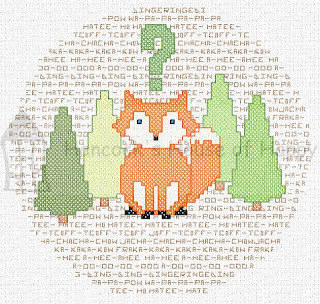 Get the free fox pattern!